Our readings this Sunday remind us that achievement of salvation is beyond human capability and depends solely on the goodness of God who offers it as a gift. In our first reading (Wisdom 7:7-11), King Solomon prayed and the Spirit of Wisdom came to him. He preferred the Spirit of Wisdom over all wealth, power, pleasure and prestige. And yet, all good things came to him through Wisdom. In our Gospel reading (Mark 10:17-30), we hear of a righteous young man who wished to be saved. He went away sad because his possessions meant more to him than salvation itself. Jesus taught his disciples that wealth and possessions were a distraction that could lead them away from the Kingdom of God. 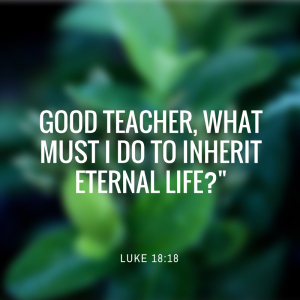 As Jesus was setting out on a journey, a man ran up, knelt down before him, and asked him, "Good teacher, what must I do to inherit eternal life?" Jesus answered him, "Why do you call me good? No one is good but God alone. You know the commandments: You shall not kill; you shall not commit adultery; you shall not steal; you shall not bear false witness; you shall not defraud; honor your father and your mother." He replied and said to him, "Teacher, all of these I have observed from my youth." Jesus, looking at him, loved him and said to him, "You are lacking in one thing. Go, sell what you have, and give to the poor and you will have treasure in heaven; then come, follow me." At that statement his face fell, and he went away sad, for he had many possessions. In our Epistle reading (Hebrews 4:12-13), we learn that the Word of God (Jesus) penetrates our very soul. Nothing is hidden from him. It is he who knows all and it is to him we must render an account. In today's Gospel, Jesus tells us our possessions will not save us, only God can save us. Our attachment to the things of this world will distract us from complete dependence and obedience to God. It may be time to consider - Do our possessions possess us? Or can we detach our selves from the things of this world to focus completely on the Kingdom God?